Agrich bagged ingredients for formula mixing for all livestock. TDI-16 is a pelleted feed designed for all ages of horses and all activity levels.It is a high energy product that is heavily fortified with minerals and vitamins and contains high quality protein.This means that you feed less and add no additional supplements! TDI- 16, when fed at recommended levels along with hay or pasture, provides all of the essential nutrients for the breeding, growing, or performing horse. TDI-16 is designed to be fed with either grass or legume type hays.This pellet becomes the horse's entire grain ration, and should not be mixed with sweet feeds, oats, or other grains.TDI-16 is simple and sensible...the one product that feeds 'em all! TDI-12 is a pelleted feed formulated specifically for adult horses who have finished growing.When fed at recommended levels along with hay or pasture, TDI-12 provides all of the essential nutrients for the breeding or performing horse. When fed in small quantities, TDI-12 is perfect for the idle horse as well. It is a high energy product that is heavily fortified with minerals and vitamins and contains quality protein. This means that you feed less and add no additional supplements! TDI-12 is designed to be flexible, so either grass or legume type hays can be fed.This pellet becomes the horse's entire grain ration and should not be mixed with sweet feeds, oats, or other grains.TDI-12 is simple and sensible...a lower protein ration without sacrificing heavy fortification and energy! 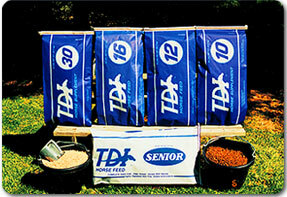 TDI-10 Supplement is a unique, pelleted feed specifically formulated to be fed to pregnant mares. However, TDI-10 also works very well when fed to "easy keepers" and growing horses which are exhibiting signs of nutritionally caused Developmental Orthopedic Disease. Fed at just 2 lbs. per day along with hay or pasture, this heavily fortified pellet becomes an easy and economical way to address the nutritional needs of these horses. TDI-10 is designed to be flexible and can be fed with either grass or legume type hays.TDI-10 is progressive and practical...a safe, economical way to significantly elevate mineral and vitamin levels - without adding excess protein or energy! TDI-30 Supplement is a pelleted product suitable for all ages of horses and all activity levels. It contains quality protein and has a high concentration of minerals and vitamins. 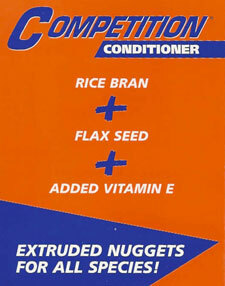 This supplement is specifically blended for those who feed whole grains or prefer to mix their own ration. This means that TDI-30 can be fed to horses individually (add 1 to 2 lbs. daily), or it can be used as the fortification pellet in a custom mix. Using TDI-30, in either manner, is an excellent way to ensure that your horse's nutritional requirements are being satisfied. TDI-30 further demonstrates its flexibility with a formulation that allows it to be fed with either grass or legume type hays. TDI-30 Supplement is progressive and practical...the key ingredient to nutritional balance in your individual feeding program! TDI SENIOR is a shredded beet pulp based ration for older horses which have difficulty chewing hay. Beet pulp is a nutritious source of roughage that horses love. TDI SENIOR is more heavily fortified than most other rations, so that an older horse can receive higher levels of vitamins and minerals.Designed to be fed as the sole ration, or supplemented with hay, TDI SENIOR really helps the older horse with special nutritional requirements. For more information about these and other products that we can get for you, come in to the store.